According to an update Friday from the World Health Organization, there have been 13,268 Ebola cases and 4,960 deaths since the first child died of the virus in December — but those figures include all probable, suspected and confirmed cases and are subject to change as more information becomes available. The numbers fluctuate as more data becomes available, and as probable and suspected cases are either discarded or confirmed. Experts warn the actual number of cases and deaths are likely far higher than what’s been reported, because people may be reluctant to seek care and officials are too overwhelmed with control efforts to record every single case. The vast majority of patients are in Guinea, Sierra Leone and Liberia. Cases and deaths are typically only recorded days after people become symptomatic or die, which complicates a real-time understanding of Ebola. According to WHO, 4,707 beds are needed across West Africa in Ebola treatment clinics; at the moment, just 22 percent of the necessary number are operational. The agency estimates a further 2,685 beds are needed for basic Ebola clinics where minimal treatment is provided and people are mostly isolated while waiting for test results. At the moment, just 4 percent of beds in these community clinics are available. Given the uncertainty around case numbers, Funk says things like bed occupancy are a good sign of how the outbreak is evolving. “We really need to see numbers go down for several weeks to be confident it’s a real trend,” he said. WHO reports that 549 health workers have been infected with Ebola, of whom 311 have died. Since Ebola is spread via contact with the bodily fluids of a patient, health workers are at high risk of catching the disease. The U.S. Centers for Disease Control and Prevention recommends that no skin be showing in a health worker treating Ebola patients. There are now eight countries that have reported Ebola detected on their soil: Guinea, Liberia, Sierra Leone, Mali, Nigeria, Senegal, Spain and the U.S. Other countries like Britain, France and Germany have taken in people sickened by the deadly virus in West Africa but they have not reported any spread of the virus there. There have been four cases of Ebola diagnosed in the U.S. and a single death — Thomas Eric Duncan, the Liberian man who was the first person diagnosed with Ebola in the country, who later died at a Dallas hospital. Two cases were nurses who cared for Duncan. The fourth is a New York doctor who became sick a week after returning from West Africa. It took two months for Britain to build and open its first Ebola treatment center in Sierra Leone this week, an 80-bed facility with a dozen other beds reserved for infected health workers. The Kerry Town clinic, near the capital, Freetown, is the first of six centers to be built by the U.K. in Sierra Leone. It includes a triage center, ambulance pads, laboratory, pharmacies and decontamination units. In about the same time that it took to build the Ebola clinic, Sierra Leone has reported more than 3,500 cases of Ebola. There is one remaining American hospitalized with Ebola, Dr. Craig Spencer in New York, a physician who worked for Doctors Without Borders in Guinea. He continues to show improvement, remains in isolation and is in stable condition. UNITED NATIONS (AP) — A new private sector initiative announced Wednesday will provide at least $450 million in commercial financing to the three West African countries hardest hit by Ebola to promote trade, investment and employment. The International Finance Corporation, which is part of the World Bank Group, announced that the package will include $250 million in rapid response projects and at least $200 million in investment projects to support the economic recovery of Liberia, Sierra Leone and Guinea after the Ebola outbreak is controlled. The announcement coincides with the U.N. Development Program’s release of a study on the socio-economic impact of the outbreak, which found that the governments of the three countries need $328 million to be able to function at pre-crisis levels. The study said the shortfalls are caused by increased spending to tackle Ebola and the slowdown of economic activity in fields such as tourism, mining and trade. IFC, the largest global development institution that focuses exclusively on the private sector, said its initiative includes a $75 million Ebola Emergency Liquidity Facility to fund critical imports for the Ebola-affected countries, including energy, food and agricultural commodities and manufactured goods. IFC said its board approved the rapid response program last week. It will initially be available to six IFC client banks and could be expanded to additional banks. The UNDP study found that because of Ebola, government expenses have risen about 30 percent in Liberia, Sierra Leone and Guinea, and fiscal deficits in the three countries are rising. In addition, Liberia has sacrificed $20 million worth of infrastructure improvements and Sierra Leone has sacrificed $16 million worth since the beginning of the crisis, it said. In Liberia, half the mining and agricultural concessions have reduced their activities, UNDP said. In northeast Guinea, exports of fruit and vegetables to neighboring countries have dropped 90 percent, and in Sierra Leone’s capital, Freetown, nearly all bars, restaurants and nightclubs have closed. That has forced the country’s largest brewery to scale down operations, culminating in a loss of 24,000 jobs in the supply chain. The financial constraints have forced the three countries to resort to domestic and international borrowing, and they have already taken financial packages from the International Monetary Fund and the World Bank, UNDP said. UNDP’s Africa regional director, Abdoulaye Mar Dieye, said the crisis has taken a toll on budgets and reduced the ability of the three governments to invest in critical areas such as health and education. MONROVIA, Liberia (AP) — The Ebola outbreak has spawned a “silent killer,” experts say: hidden cases of malaria, pneumonia, typhoid and the like that are going untreated because people in the countries hardest hit by the dreaded virus either cannot find an open clinic or are too afraid to go to one. Evidence of what the World Health Organization calls an “emergency within the emergency” is everywhere in Guinea, Liberia and Sierra Leone, the West African countries worst hit by the Ebola epidemic. It can be seen in a decline in the number of kids being vaccinated for preventable diseases. It can be seen in the mother who crosses Monrovia, Liberia’s capital, searching for an open clinic that will treat her 3-year-old daughter who has a fever and is vomiting, both signs of Ebola but also of many other diseases. It can be seen at the hospital in Kissidougou, Guinea, which sees not even a tenth of the patients it used to. It can also be seen at the hospital outside Sierra Leone’s capital run by the medical charity Emergency. It is inundated with patients because nearby hospitals are closed or only partially operating. “There’s this incredible silent killer health crisis behind the Ebola crisis,” said Eric Talbert, the executive director of Emergency’s U.S. branch. None of roughly a dozen experts interviewed by The Associated Press could say how many people might be sick or dying for lack of health care. Tracking the diseases that usually plague Guinea, Liberia and Sierra Leone — malaria, pneumonia, cholera and diarrhea diseases — is difficult even in the best of times. Now the countries’ already weak health systems are broken down amid the Ebola epidemic. In July, only about half the health facilities in Liberia were reporting data to the Health Ministry. That doesn’t mean half the facilities were closed, but it shows many were at least not operating fully. 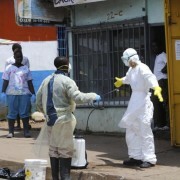 Hospitals and clinics in Sierra Leone have also been forced to shut or curtail their activities. There are signs of improvement. In Guinea, many facilities were open in September but they were waiting for patients. The hospital in Kissidougou, near where Ebola outbreak began, was seeing only 12 to 15 patients a day at the end of September, compared to the typical intake of 200 to 250 patients, said Dr. Franco Pagnoni, who at the time was WHO’s Ebola field coordinator there. “If we don’t pay attention, we will have thousands of deaths because of Ebola, but we will have tens of thousands of deaths for other diseases,” said Pagnoni. WHO noted simply that there are “high numbers of deaths” from other diseases. Mariama Bary’s 3-year-old daughter risked becoming one of the fatalities. Bary took the girl around Monrovia, looking for treatment as she had a fever and was vomiting, according to SOS Children’s Villages, a charity that runs a medical center there. Bary struggled to find a clinic that was open or that would accept a child with symptoms of Ebola. She was finally able to get treatment at the SOS center, where the girl was diagnosed with malaria, the charity said. In an effort to encourage more clinics to open and accept patients, WHO has developed a set of “no-touch” guidelines for community health workers who work in small, basic clinics. With little protective gear, they are supposed to keep their distance from patients and ask, for instance, a mother to feel her child’s forehead to see if he has a fever. But there is no way to vaccinate someone without touching, and so vaccinators require protection. Vaccination rates have suffered at least in part because immunization campaigns — large events organized to vaccinate children who have missed their routine check-ups — have been on hold in all three countries since May. 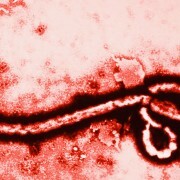 There won’t be any before the end of the year because large gatherings could serve as hotbeds for Ebola transmission. This could have devastating effects, WHO warned recently, noting that cases of measles have been reported in Ebola-affected countries and that there is a “growing risk of significant measles outbreaks.” A full-blown outbreak could create another public health emergency. Docas Kollie, a 24-year-old mother, walked for three hours this week to get to the Pipeline Community Health Center for a vaccination for her 3-week-old infant. When she gave birth, it was away from the care of medical professionals. “Because of the Ebola situation, there was no hospital for me to go to deliver. I delivered in the community,” she said. Because the community clinic is closed in the U.N. Drive section of Monrovia, some mothers do the diagnosing themselves and get whatever they think their children need at a pharmacy. Last week, Doctors Without Borders announced it will hand out anti-malarial medication — which can be taken either as a treatment or preventively — to families in the poorest parts of Monrovia. The group will eventually hand out enough medication for 300,000 people to treat themselves for three months. It plans a similar program in the Sierra Leone capital of Freetown. Typically, sick people would seek treatment for malaria at a clinic, but with so many facilities closed and people wary of them, the medical group wants to blanket communities with malaria protection. Anti-malaria programs have been trying for years to get countries to test before treating malaria because giving drugs unnecessarily raises the strains will become drug-resistant. But Thomas Teuscher of Roll Back Malaria says malaria treatment has been so severely neglected amid the Ebola epidemic that even giving medication to those who might not have malaria is justified. “We’re so concentrated on this very scary Ebola thing — because we don’t understand it, we don’t see it very often, it is just very worrisome — and so we forget about the very common things,” said Teuscher. DiLorenzo reported from Dakar, Senegal. Associated Press journalist Wade Williams in Monrovia contributed to this report.